VERONA, NY – Turning Stone hosted “Kings of the Ring: A Conversation with Mike Tyson and Larry Holmes” today to promoted this week’s ESPN Friday Night Fights (see fact sheet below), promoted by Iron Mike Productions, at the resort casino in upstate New York. Longtime sports columnist for the Syracuse Post-Standard and Syracuse.com, Bud Poliguin, served as the moderator, asking the two Hall of Famers and world heavyweight champions a series of questions, before the floor was opened for the many fans in attendance to ask Tyson and Holmes questions. Poliguin opened by noting Tyson and Holmes had a combined career record of 119-12, including a total of 44 world title fights between them. 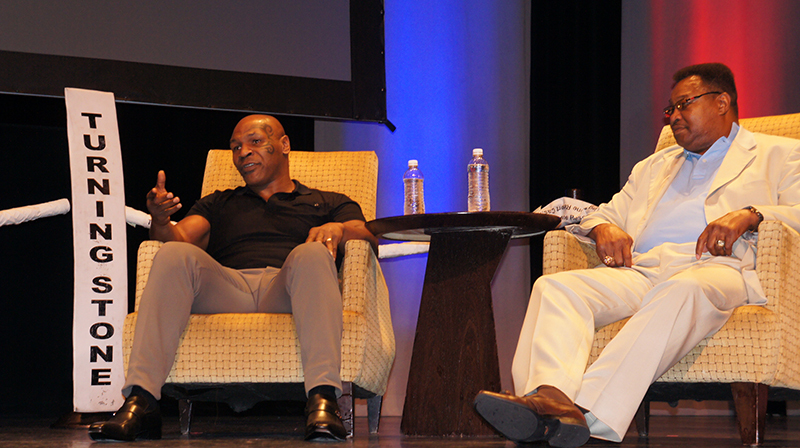 Tyson: “It was a great opportunity to be in the ring with one of the great fighters of all time. It was a milestone in my career. He didn’t have time to prepare. I never fought the great Larry Holmes. I had no delusions; by all means, I didn’t fight the Holmes who fought Ali. TYSON: “That was a feat of strength. He looked like he got shot by a shotgun. It was amazing. OTHER: Doors Open 7:00 p.m. ET, first bout 8:00 p.m. ET, ESPN FNF starts 10:30 p.m. ET. ABOUT IRON MIKE PRODUCTIONS (IMP): Founded in 2013 by CEO Garry Jonas and Hall of Famer Mike Tyson, Iron Mike Productions is a full-service boxing promotional company with offices located in Deerfield Beach, Florida and Las Vegas, Nevada. IMP is committed to changing traditional boxing promotion by advocating for its fighters’ successes, inside the ring and out, throughout their professional careers and into retirement. For additional information go online at www.IronMikeProductions.com, friend on Facebook at www.Facebook.com/IronMikeProductions.Official, or follow on Twitter @IronMikeProd.